(WASHINGTON, D.C., 1/31/19) – The Council on American-Islamic Relations (CAIR), the nation’s largest Muslim civil rights and advocacy organization, today reminded all Americans who value religious freedom to take part in its click and send action alert urging members of Congress to support recently-introduced legislation repealing the Trump administration’s cruel and discriminatory Muslim Ban. Introduced this week in the House by Representative Judy Chu (D-CA) and in the Senate by Senator Chris Murphy (D-CT), the bill would make no funds available to carry out the Muslim Ban. The bills have 57 and 29 cosponsors respectively. “The Muslim Ban – now in its third iteration, but wrong in any form – is just one of the weapons Donald Trump is using to foment xenophobia and bigotry and drive wedges in our communities," said Rep. Chu. "It is simply unamerican." CAIR’s action alert also urges Members of Congress to cosponsor Representative Don Beyer’s (D-VA) Freedom of Religion Act introduced earlier this month, which amends the Immigration and Nationality Act (INA) to prohibit the denial of entry into the United States based on religion. That bill has 129 cosponsors. On Friday, January 27, 2017, President Donald Trump signed an Executive Order 13769 targeting Muslim immigrants and refugees. The first of what would become three discriminatory executive orders, initially targeted seven Muslim-majority countries for 90 days, non-Syrian refugees for a period of 120 days, and Syrian refugees indefinitely. 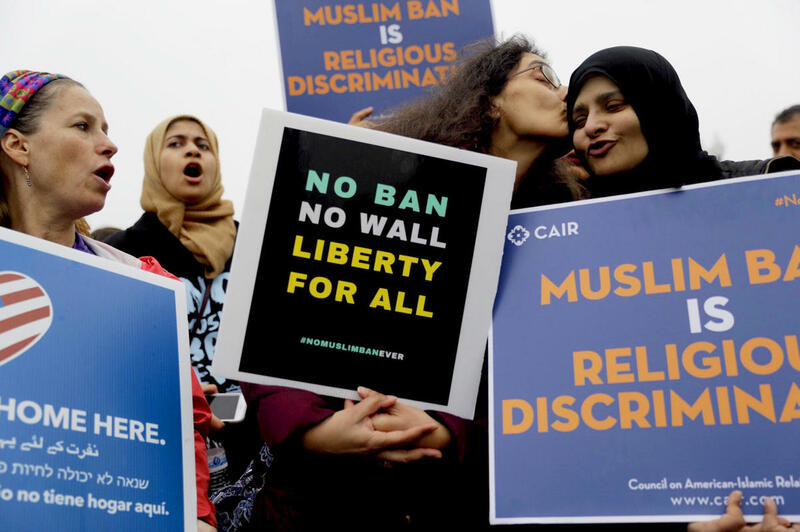 Since the Trump administration’s first attempt to ban Muslim immigration to the United States, CAIR, other civil and human rights organizations, and several states filed legal challenges to each of the ban’s permutations. Disappointingly, in June 2018 the U.S. Supreme Court in a 5-4 decision decided to permit the third iteration of the Muslim Ban to remain in effect and reversed a lower court injunction that had -- until December 2017 -- prevented the Trump administration from using its third Muslim Ban as a basis for denying visas to foreign nationals from eight affected countries, six of which were Muslim. CAIR believes that the Supreme Court’s decision to not overturn the Muslim Ban is a setback, not the end of the road. The responsibility is on the American Muslim community and its allies to push for an end to the Muslim Ban. It is now up to the U.S. Congress to do what the Trump Administration and the Supreme Court are unwilling or unable to do: #RepealTheBan and other limitations on refugees and persons of color from traveling or immigrating to the United States. The Washington-based Muslim civil rights organization has reported an unprecedented spike in hate incidents targeting American Muslims and members of other minority groups since the election of Donald Trump as president.